In 1977, my husband Merlin and I went on “Allah’s Guided Tour a six-month hitchhiking adventure all around Turkey, through Afghanistan and Iran, into the winter snows near Kashmir and finally arrived in Amritsar, the gateway to India…For another year, we immersed ourselves in this nonlinear wonderland, tasting Sivananda’s yoga, bhajan, the village life, months of yellow-eyed hepatitis (in Rishikesh), Vipassana meditation with Goenka-ji at Igatpuri, waiting for Satya Sai Baba’s darshan in Puttaparthi… Mostly we wandered along the banks of the Ganges and up in the Himalayas, greeting fellow sadhus of every shade. Towards the end of our year there, we landed in Auroville, an international community in Pondicherry which is devoted to spiritual service. We were touched with the level of creativity we encountered there and the spirit release. The residents seemed to work hard, yet offered the outcome of their labor to God, regardless of gain or loss. We knew it was time to put down roots somewhere, and to begin tending our own literal and figurative garden. Not in India, but somewhere. So in 1979 we returned home, hitchhiking through Khomeini’s Iran, around Afghanistan (a whole ‘other story) to Missoula, Montana. We got directions and went right there, bypassing all other leads from our magazines and various friends. I was pulled by some mysterious attraction to this one place. We stayed at Devil’s Den State Park and wandered the nearby mountainside at Wattle Hollow the next day. By the time we got to the corner of two creeks, Wattle and Lee, we knew we were “home”. Yupp, we said, and put up a mailbox and a tent that day. Dug a latrine and erected a compost bin the second day. Cut some Locust trees and scraped off the bark for the beginnings of our post and beam home that week… A couple of rookies in the woods. We were astounded by the deafening nighttime chorus of the tree and pond frogs, cicadas, and made a tape to send home to our friends in Montana. Eventually, we got a rototiller through the Star Shopper that Merlin converted into a generator, for electricity. The adventure goes on and on. We learned to find consensus , to work very hard, to be patient and forgiving and resourceful. We learned to return to love, over and over. Merlin died of cancer on the winter solstice, 1985, after eighteen months of healing efforts. 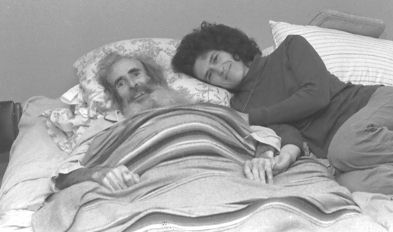 He died at home with me, in a peaceful and sacred passage…the experience was simultaneously my greatest lesson, healing and blessing. I was given a song to sing to him on his journey out of the body, and have shared it with others and sing it to my own heart to this day. I had already returned to school for a counseling degree, and went on to become a therapist (LPC). After working with Hospice and in practice as a grief therapist for ten years in Fayetteville, I began to feel my path shifting, along with the dissolution of a second marriage. I wanted to be on the land, wanted the healing work to be done with the natural sights and sounds, smells and textural delights of Wattle Hollow. So Wattle slowly took on another life as a retreat center, in the late 80’s. The first several retreats were called “Gathering the Threads”, for survivors of childhood abuse, employing psychodrama, artwork and journalizing. 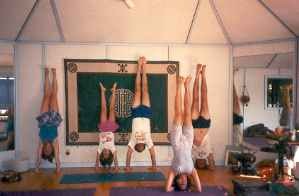 Ensuing years saw chi gung, tai chi, yoga, and holotropic breathwork unfold in the classroom overlooking the pond and mountains, while facilities grew all around it. More recently, the focus has been yoga, vipassana meditation and dance, as well as a sanctuary for individual retreatants. 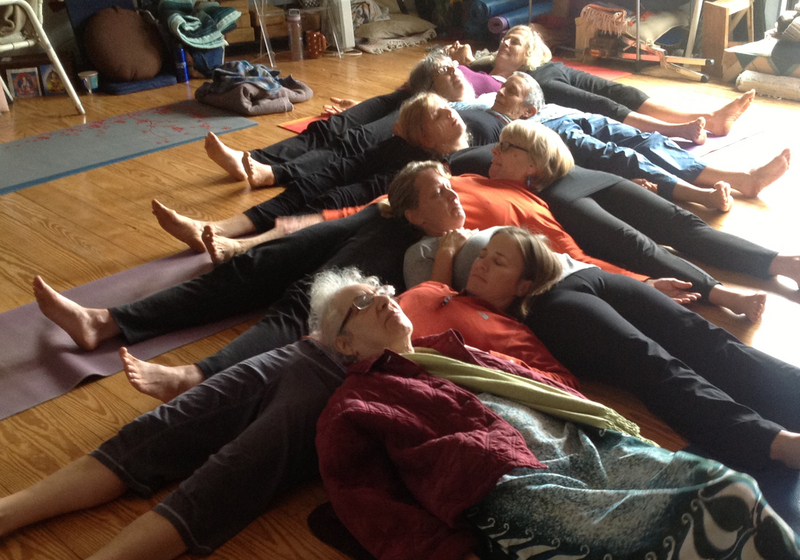 Teachers come from all over the country to conduct weekend workshops, and I also teach what I love most : meditation, yoga, dance and combinations thereof. And once a year, Wattle closes to visitors, for a least 40 days of silent solo introspection, while I clean out my own “closets” of accumulated stuff. Reaching inward in a safe place, creates an opportunity for us to become sane and present. With the security of knowing who we are, we can befriend the land and each other. It is an experience in being and having enough, here and now.